Marilyn Mae Goedert was born Oct. 7, 1948, in Alliance to Russell and Ruby (Reeves) Sommers. She attended grade school in Hyannis and later attended school in Wallace, graduating with the class of 1966. Following high school, Marilyn enrolled in the School of Practical Nursing at Kearney State College. 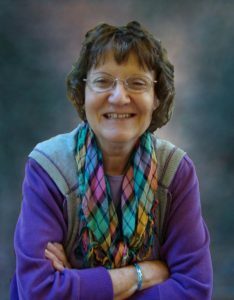 Following her education, Marilyn moved to Denver and worked in the surgical operating room at Colorado General Hospital and later was a private scrub nurse for three neurosurgeons in Denver. She moved to Omaha where she worked at Nebraska Medical Center as an operating room nurse for 17 years. She was the director of Recovery Services at Nebraska Organ Recovery System for 15 years. For the last nine years, she worked as a video monitor at Nebraska Medicine. Marilyn was united in marriage to her high school friend, Jim Goedert, on March 1, 2018. Jim nicknamed her “Red” because of her auburn hair. Marilyn loved good food and traveling. She also enjoyed “Find a Grave,” power shopping and entertaining friends and family. She will be remembered for her sense of humor, which could make anyone smile. Left to cherish her memory are her husband, Jim Goedert; children, Andrew Neal and Andrea Neal; stepchildren, Jimmy Goedert, Jeffrey Goedert and his wife, Joleen, and Jonathan Goedert; grandchildren, Titus and Shepard Neal, Caitlyn and Taylor Goedert and Kelli Kuecker; great-grandchild, Theodore Kuecker; mother, Ruby Sommers; brother, Wally Sommers and his wife, Janey; along with many nieces, nephews, other relatives and friends. Marilyn was preceded in death by her father, Russell. 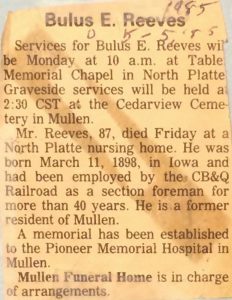 Services for Bulus E. Reeves will be Monday at 10 a.m. at Table Memorial Chapel in North Platte. Graveside services will be held at 2:30 CST at the Cedarview Cemetery in Mullen. Mr. Reeves, 87, died Friday at a North Platte nursing home. 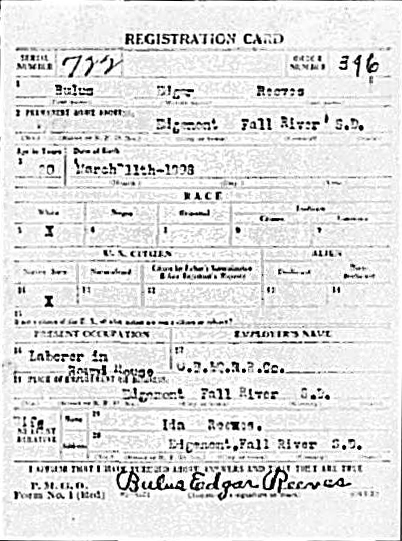 He was born March 11, 1898, in Iowa and had been employed by the CB&Q Railroad as a section foreman for more than 40 years. He is a former resident of Mullen. A memorial has been established to the Pioneer Memorial Hospital in Mullen. 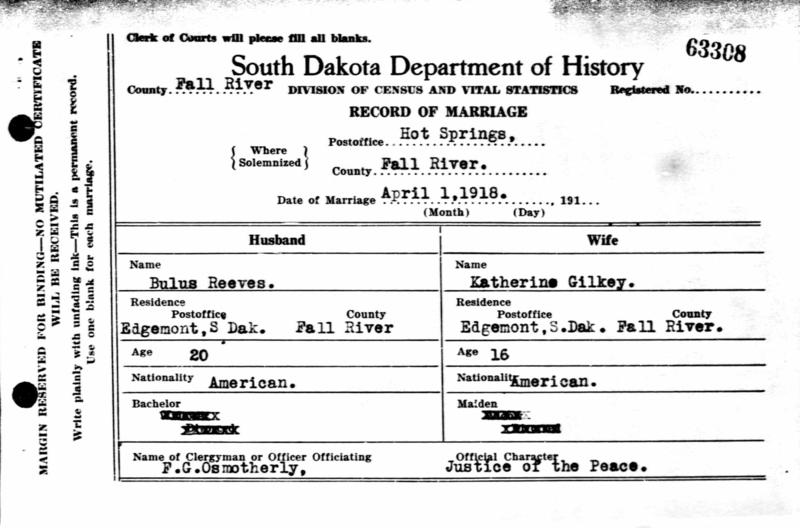 Brothers Elzie Reeves & Bulus Reeves married sisters Anna Gilkey & Ida Gilkey, respectively, in a double ceremony on April 1, 1918 in Hot Springs, South Dakota. 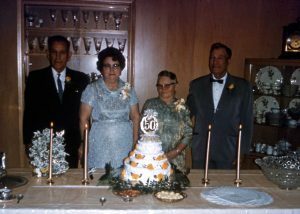 For their 50th anniversaries the Reeves family gathered in Mullen, Nebraska to celebrate. Charles Gilkey, our ancestor, was born in 1775 and died 1883. He and his wife Hannah, had two sons, John and William both born in Ireland. Our ancestor, John and his wife had a son, J. Francis Gilkey, was born in Westmoreland County Pennsylvania, in 1810. He was my great, great grandfather. Francis married Mary Frew, daughter of David Frew. They were the parents of three sons: David, James and Frank. Mary died at the birth of Frank. Francis, with a baby and two small boys, married Mary’s sister, Sarah Frew. That same year William Kenneth was born September 10, 1846. There was also a daughter, Isadora Minerva. Francis was a farmer. He died April 12, 1877 and Sarah died December 19, 1872. William Kenneth Gilkey, my great grandfather was also born in Westmoreland County. He enlisted in the Army during the Civil War, on March 11, 1865, serving with Company G. the 11th Regiment of the Pennsylvania Infantry. He became wounded in action, having the forefinger of his right hand shot off on May 10, 1865. 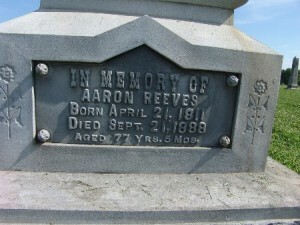 He was dismissed from the hospital May 27, 1865. 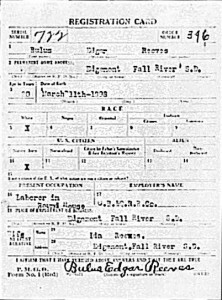 Later, William Kenneth Gilkey received a disability discharge, and was mustered out of the Army at Balls Crossroads, Virginia on July 1, 1865. W. Kenneth’s army buddy, John Martz, was later killed in action. While they were together, he often talked about his wife and children. John asked W. Kenneth to visit his widow if he should be killed. After W. Kenneth was informed of his buddies death, he did look up his friends widow. According to my Grandparents, in doing as his friend, Martz had asked, W. Kenneth became involved. He found a young woman with six small children, who needed help in a very real way. There was wood to chop and carry in. The water had to be carried up a steep hill. Kenneth stayed and busied himself with the many chores to help this lady in her time of grief. They soon married. It isn’t known if the marriage was for convenience, or if it was because the ‘love bug’ bit. I have hoped it was for love!! After Kenneth and Susan Deitman Martz were married they had twin daughters, Mary Sarah and Sarah Mary. Later, Franklin Westley Gilkey was born December 23, 1869 in Irwin, Pennsylvania. Harrison Gilkey was born August 10, 1972. Franklin W. Gilkey, our grandfather, married Catherine Love on December 24, 1888, in Irwin, Pennsylvania. 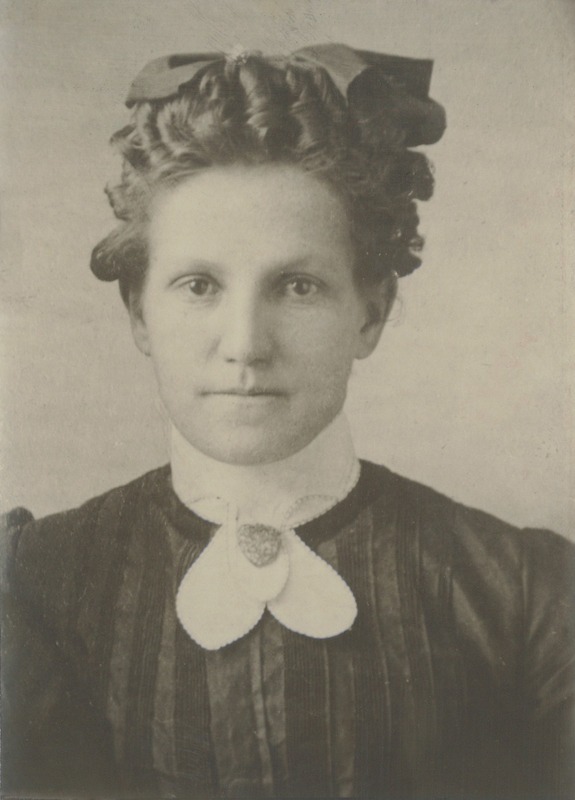 Catherine Frances Love was born March 10, 1872 to John and Charlotte (Edwards) Love. John Love was mean to his family. An older son, James Love left home at fourteen, and was never seen again. John Creighton, a neightbor took Catherine into their home. Later when she married, because she was under age, John gave his consent. Grandma Gilkey told me they were married the day after F.W.’s nineteenth birthday. I never knew what difference it made, maybe they felt better being older. Franklin and Catherine (Katie) eventually moved to Ardara, Pennsylvania, where their ten children were born. Ardara isn’t on the map now, and I don’t know if there is a town there, by another name. Their children were: Ella May, Jeffery Harrison, William West, Edward Adam, Royal Robert, Ida Katherine, Anna Deborah, Birdie Marie, Bessie (Betty) Margaret and Franklin Daniel. Grandma said it was very hard losing baby Royal less than a month old. They raised the other nine children. Grandpappy Gilkey worked at Pitcarin, Pennsylvania for the railroad. It was in the yards or shop, I’m not sure. He walked to and from work, a distance of five miles each way. He was gone from home fourteen hours every day, working twelve hours a day, and sometimes seven days a week. He left home in the morning before the children were awake and they would be tucked into bed when he returned at night. Ella, as a small child, wanted to know who that man was that came late and slept with her mother. Ella, our mother, was born June 2, 1890 to Franklin and Catherine Gilkey at Ardara, Pennsylvannia. Grandma Gilkey told me, she had miscarried their first baby. Ella started helping around the home at an early age. There were four little brothers born about two years apart, before the birth of another sister. When Ella was about eleven, she started helping an older neighbor lady. She carried water, coal and wood, and did other errands for her. As the lady needed more care, Ella stayed nights with her until she died. Jeff and Bill also started doing odd Jobs to help. As soon as they were old enough they went to work with their dad for the Railroad. After Ella’s grandmother died, she helped her grandfather by cleaned his house and cooking his meals. 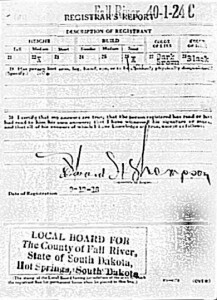 Ella’s grandfather died in 1909. She had graduated from the eighth grade, and never been far from home. Ella was a very pretty young lady, with golden red hair, which was curly and the bluest, blue eyes. She had a ‘peaches and cream’ complexion. Soon after the death of her grandfather, Ella went to Trafford City, Pennsylvania, where she was employed as a dinhing room girl at the Trafford Inn. The manager, Mrs. Clauson, had very strict house rules for all the girls. They were to be polite and helpful to the men who roomed there, but there was to be no extra visiting, and no dating. Ella was all business, not giving the men the time of day. She was there to work!! When the girls that cleaned the mens rooms were over-loaded, the girls from the dining room helped them when it wasn’t meal time. This is where Frank Albright, our father roomed and boarded while he was working at the Trafford City foundry. However,cwith some help Frank started dating Ella. 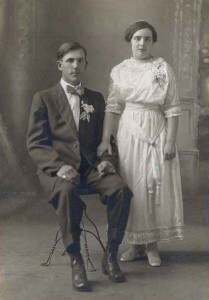 Frank and Ella married in May 1911, and came West to locate a farm to make their home. About one year after they had settled in South Dakota on a farm in Red Canyon, ten miles from Edgemont, my mother, Ella, became very homesick for her family. She had never been away from her folks for more than a week before this. Ed, her fourteen year old brother came out the fall of 1912, to visit. 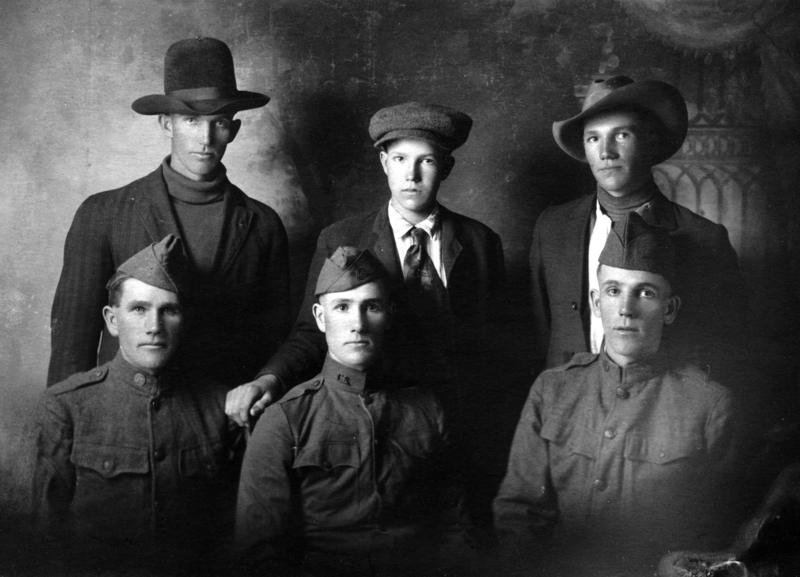 The rest of the Gilkey family, except Bill, moved to South Dakota the following June in 1913. Bill stayed behind so the family would have money for the move. He came six months later. 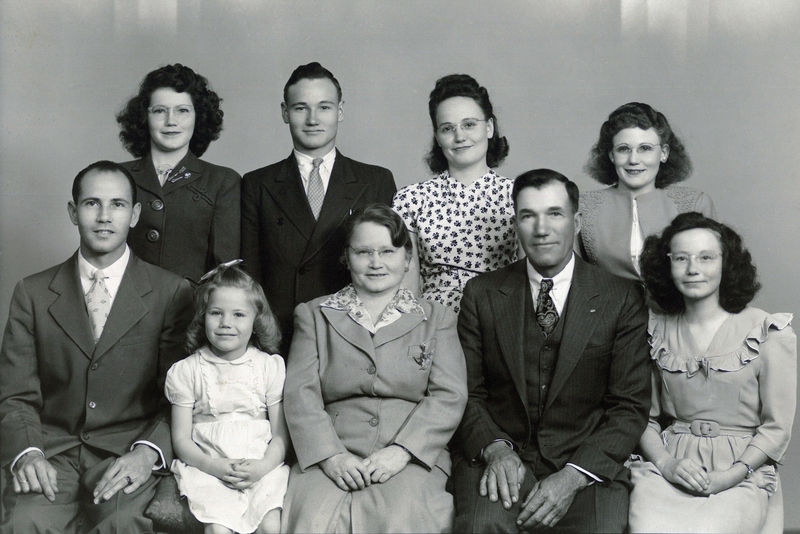 The Gilkey family stayed with Ella and Frank while they looked for some land to homestead. They settled about three and a half miles up the Canyon from the Albrights. There was a log school house on the land, which provided them with a livable house. Grandpappy was a carpenter, and soon he and Jeff added to the log cabin by building a larger frame structure, which was used for bed rooms for the family. The grandparents didn’t know anything about farming. It soon became known Grandpappy was afraid of most animals. I don’t think they ever had a team of horses. They did get a cow and chickens. Ed milked the cow and took care of the chickens. In a short time, because they needed money to buy groceries, Grandpappy and Jeff went to work in Edgemont at the railroad yard. They batched in town during the week, while Grandma stayed on the land with the younger children. When fall came the children went to school at the log school near the Stevens place. The two older Gillett boys drove a team and wagon every day to this school and all the neighbor hood children rode with them. In 1915 a school was built in the area and the children went to the new school for a year and maybe more. The T.J. Markey was their teacher. After several year the split living arrangement became too stressful. 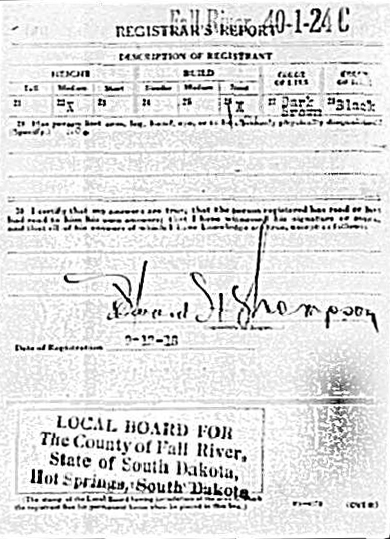 At this time Bill was also working for the railroad, so with three incomes, they decided to more the family into Edgemont. Ed remained on the land to hold their rights to the land. I believe they had a short time until they could prove up on the land. The three men continued to work there until 1922 when there was a big strike on the railroad. They went on strike with the other men. After the strike was settled they never went back, although they could have. From that time Grandpappy worked at many odd jobs. For a number of years he was clean-up man at the Bar Cafe. The cafe was owned by Al Anderson. Pappy washed dishes on the early night shift, getting off work about eleven each night. The grandparents became active in the Methodist church. They had been in the church in Pennsylvania, so it was natural to get involved here. My grandpa liked to sing. 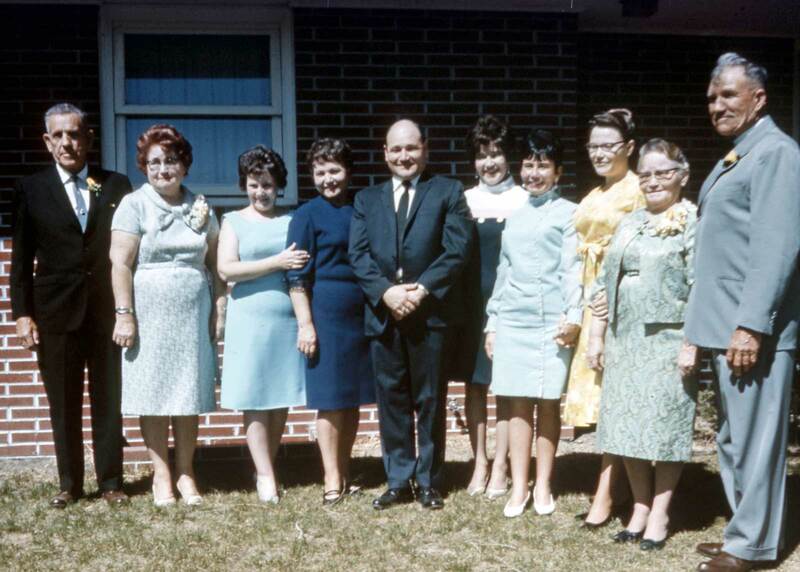 They were instrumental in the starting of what is now the Assembly of God church in Edgemont. One year the small group had services in the Gilkey home, until they had a building. Bill left home in about 1924 or 1925 to work in the oil fields in Oklahoma. He was last heard from in 1926. We could not find out what happened to him. 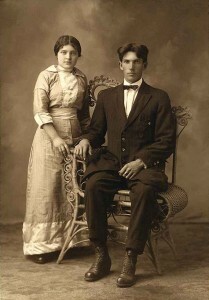 Jeff was born July 17, 1892, was married to Birdie Willard, a school teacher. They had two sons, Westley and Harrison. Jeff died in November 1971. 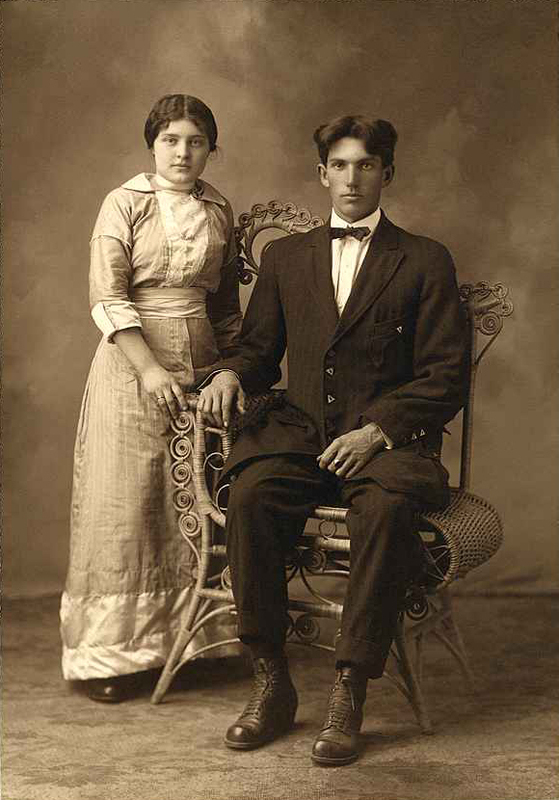 Edward was born December 16, 1898, and married Bertha Gillett, a neighbor. 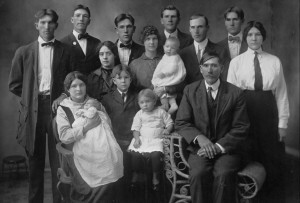 They were the parents of seven children, Orval, Roy, Franklin, Dorothy, Joyce and two babies that died, Eugene and Clio. Ed died in August 1965. 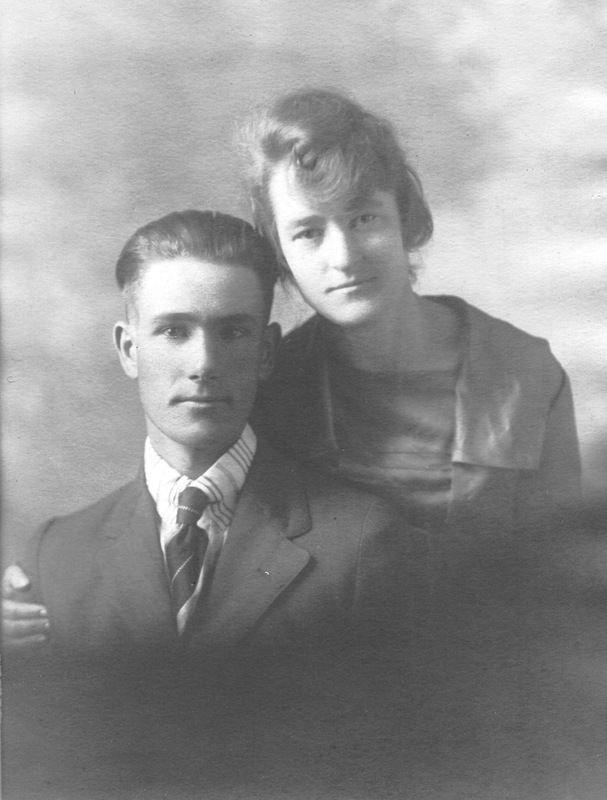 Katherine (Toots) was born August 18, 1901, and Anna was born July 10, 1903; married brothers, Bulus and Elzie Reeves in 1918. Toots and Bulus children are; Arthur, Lois, Ruby, Ray, Betty, Iola, Evelyn and two babies that died, Hazel and Martha. Anna and Elzie had five children; Richard, Mildred, Leonard and two babies that died, Verna May and Virginia. Toots died in May 1978. Anna died in November 1986. Birdie was born April 29, 1907. She married Edward Knapp and were divorsed. She died in January 1974. Betty (Bessie) was born July 9, 1909. She married Morton Stern, they divorsed. She died in August 1981. Ella, the oldest was born June 2, 1890 and married Frank Albright. 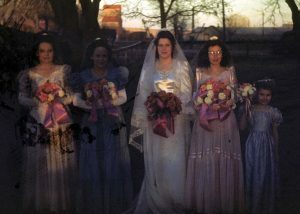 They had seven children; Catherine, Caroline, Frank, Maizie, Darlyne, Joanne and Rose who died at age four. This names the decendents of F.W. and Katie Gilkey. All the Gilkey children moved from this area to establish their homes, except Ella. The grandparents also remained in Edgemont. After the children left home Grandma worked for other people doing their laundry. She was good at this job. She house cleaned for two families for years. She was loved by all and didn’t have trouble getting all the work she wanted. The grandparents were short and stocky in stature and a nice looking couple. Grandma Gilkey died Septmenber 5, 1934 at their home in Edgemont. During the summer she suffered a stroke. She was sixty-two years of age. After Grandma’s death Grandpappy continued to live in Edgemont. I became his ‘girl Friday’. I took him shopping for groceries, we went to church together and I cleaned his house. Once a week I washed and ironed his clothes and did extra baking and cooking for him. When his health began to fail, Aunt Betty thought he needed more care. Pappy was then moved to Oregon to live with Frank and Alma. I missed him very much. Grandpappy had been a part of my life for so many years. I don’t know how long he was with Frank, but the last two years of his life were spent with his daughter, Toots at Mullen, Nebraska. Grandpappy Gilkey passed away at Omaha, Nebraska July, 24, 1951. Both grandparents are buried in the Edgemont Cemetery. If our grandparents could take a peek at our lives and our homes today, they would think we were living in heaven. We all enjoy so many modern conveniences that they never dreamed of. We have every kind of gadget to ease and lighten our work. My memories of them are wonderful. Every child should have an opportunity to enjoy grandparents as I have. All our aunts and uncles are gone, also some of the cousins. My Uncle Frank, the youngest was the last to leave us. He and I had a special friendship. He was like an older brother. During our growing years, Frank spent some time every summer with us on the farm in Red Canyon. He helped with the chores, and gave us some wise counsel from time to time. SPRINGPORT, Mich. – A former resident of Hyannis, Ray A. “Baldy” Reeves, 55, 118 E. Main, Springport, Mich., died March 21 in Springport. He was born May 18, 1928, at Nahant, S.D. 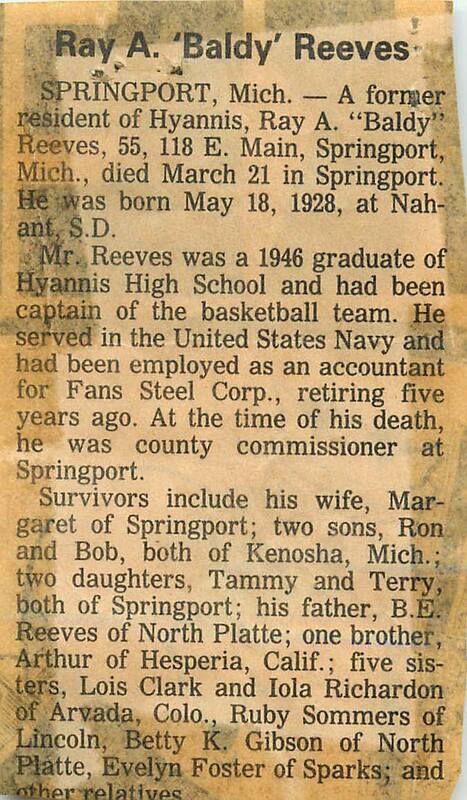 Mr. Reeves was a 1946 graduate of Hyannis High School and had been captain of the basketball team. He served in the United States Navy and had been employed as an accountant for Fans Steel Corp., retiring five years ago. At the time of his death, he was county commissioner at Springport. Survivors include his wife, Margaret of Springport; two sons, Ron and Bob, both of Kenosha, Mich.; two daughters, Tammy and Terry both of Springport; his father, B.E. 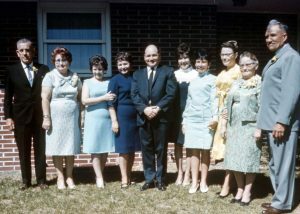 Reeves of North Platte; one brother, Arthur of Hesperia, Calif.; five sisters, Lois Clark and Iola Richardson of Arvada, Colo., Ruby Sommers of Lincoln, Betty K. Gibson of North Platte, Evelyn Foster of Sparks; and other relatives. 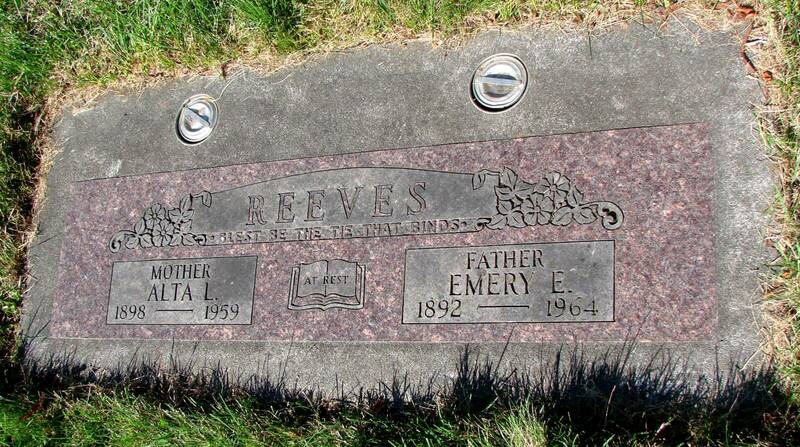 Ray A. Reeves was born May 18, 1928 in a small town Nahant, S.D., to Bulus and Ida K. Reeves. He married Margaret Reopke on Sept. 29, 1951. He is survived by his wife Margaret; two sons Ronald and Robert, both of Kenosha, Wis.; two daughters, Tammy and Terri of Springport; two daughters-in-law, Judy and Barbara of Kenosha; five grandchildren Jeremy, Jaclyn, Christen, Rebecca and Richard; his father Bulus of Nebraska; five sisters Iola, Ruby, Betty, Lois and Evelyn of Nebraska and Colorado; and one brother Arthur of California. He held a bachelors degree in accounting from Northwestern University and a Masters degree in finance from Lake Forest College. He was employed by Fansteel Corp. for 27 years when he retired. He was a member of the Springport Lions Club and the Springport Friends of the Library. He was a past president and lifetime member of the Eagles, past church treasurer, past Little League coach and past Boy Scout leader. He was a lifetime member of the American Legion. He served in the United States Navy during the Korean conflict and was honorably discharged. This newspaper clipping incorrectly spells Ray’s father’s name as “Beulus” , instead of “Bulus”. 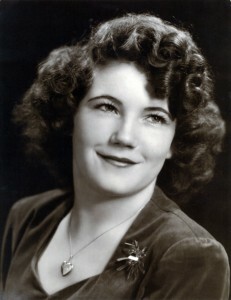 MINDEN – Betty K. (Reeves) Gibson, 82, of Minden, formerly of Mullen and North Platte, died Sunday, April 29, 2012, at Bethany Home in Minden. Memorial services will be at 1 p.m. MDT May 18 at St. Joseph’s Episcopal Church in Mullen with the Rev. Bill Graham officiating. Scattering of cremains will be later. 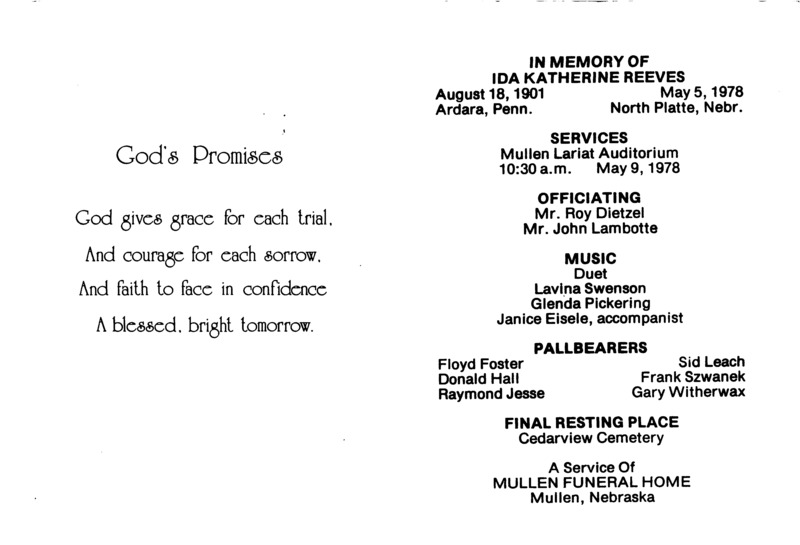 O’Brien-Straatmann-Redinger Funeral Home in Kearney is in charge of arrangements. 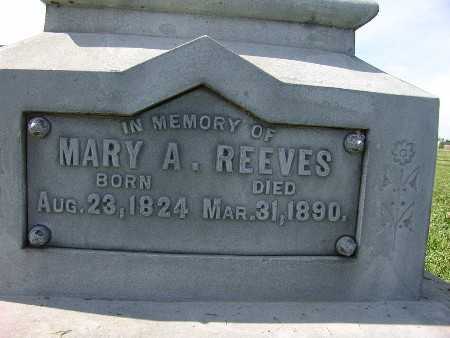 She was born Feb. 7, 1930, at Nahant, S.D., to Bulus Reeves and Ida Gilkey. 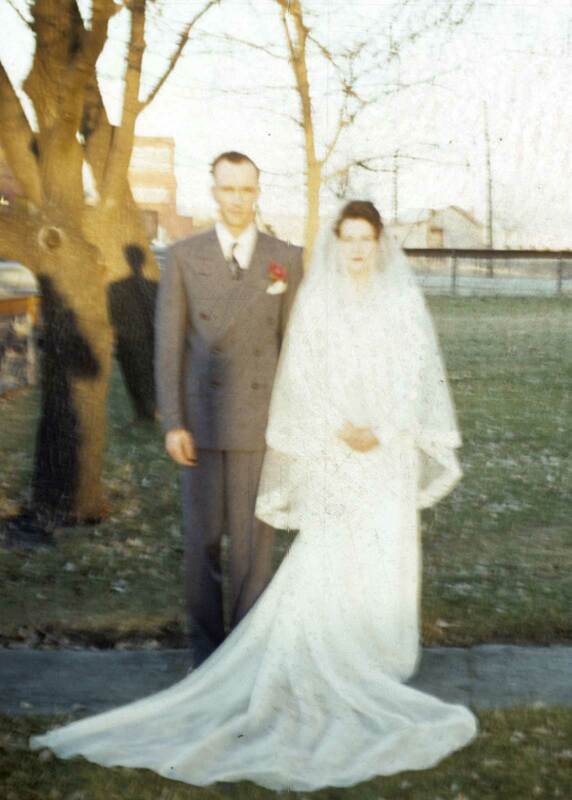 On Nov. 14, 1948, she married John “Bud” Gibson Jr. He preceded her in death. Survivors include her son, Dan of Plattsmouth; daughter, Shari Bergmeier of Kearney; sisters, Ruby Sommers of Omaha, Iola Richardson of Arvada, Colo, and Evelyn Foster of Sparks; six grandchildren; and four great-grandchildren. Betty graduated from Hyannis High School, after which she earned her teaching certificate from Chadron State Teachers College. She and her husband, Bud, owned and operated the Mullen Cafe for 12 years. Additionally, she taught for numerous years at various rural schools throughout the Sandhills. In addition to her husband, she was preceded in death by her parents; eldest son, Eddie; and siblings, Arthur, Ray, Lois, Hazel and Martha. Memorials are suggested to the family for later determination. Visit osrfh.com to submit online condolences. 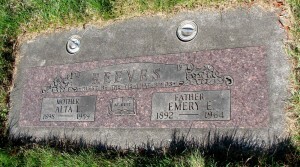 This is the gravestone of Emery E. and Alta L. Reeves in the Park Hill Cemetery, Vancouver, WA. This is Elzie’s first wife, Clara Crandall. She passed away in 1916, and Elzie later married Anna Gilkey in 1918. This is the gravestone of Aaron & Mary A. Reeves in the Sandyville Cemetery, Sandyville, IA. Ida’s birth certificate shows her middle name spelled as “Catherine”, matching her mother’s name “Catherine Love”. However, most other sources show the spelling as “Katherine”. 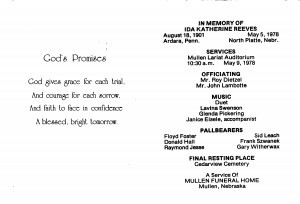 Services were held May 9 for Ida Katherine Reeves who died in North Platte at the age of 76 years, 8 months and 17 days. Mr. Roy Dietzel and Mr. John Lambotte officiated at the services held at the Lariat Auditorium. Music was provided by Lavina Swenson and Glenda Pickering, duet, and accompanist Janice Eisele. Pallbearers were Floyd Foster, Donald Hall, Raymond Jesse, Sid Leach, Frank Szwanek and Gary Witherwax. Interment was at Cedarview Cemetery. 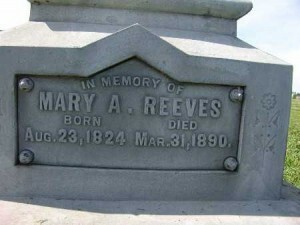 Ida Katherine Reeves was born in Ardara, Penn. August 18, 1901. She was the daughter of Franklin W. and Catherine Love Gilkey. Her father was a railroad carpenter and her mother was the daughter of a circuit rider evangelist. 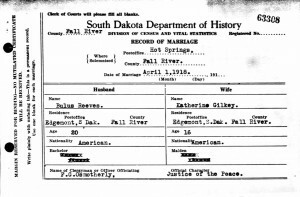 She was united in marriage to Bulus Edgar Reeves on April 1, 1918 in a double wedding ceremony with her sister Anna and his brother Elzie in Hot Springs, S.D. 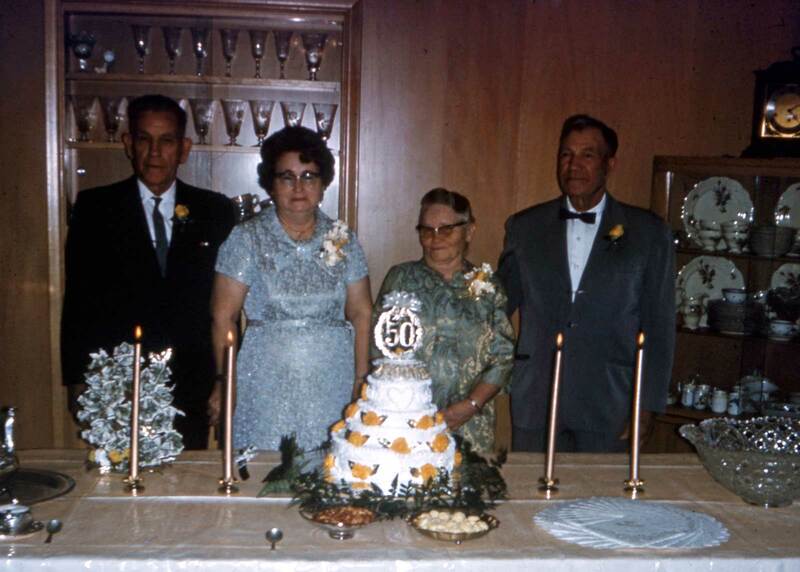 Both couples celebrated their 50th wedding anniversary together in Mullen in 1968. Bulus and Ida Katherine celebrated their 60th wedding anniversary on April 1, 1978. 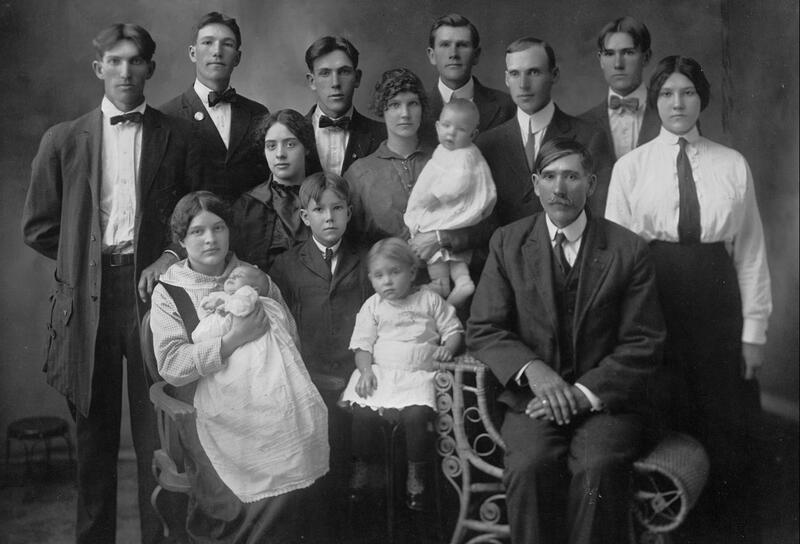 Nine children were born to this union – Arthur of La Mirada, Calif.; Lois Clark and Iola Richardson of Arvada, Colo.; Ruby Sommers of Lincoln; Ray of Jackson, Mich.; Betty Binegar of North Platte; and Evelyn Foster of Sparks, Nebr. Two children – Hazel Irene and Martha Ellen died in infancy. Mr. and Mrs. Reeves homesteaded in Red Canyon, S.D. before moving to Edgemont, S.D. They moved to Hyannis in 1935 and to Mullen in 1947. She professed her faith in 1938 and has continuously lived for the Lord. She was a kind and loving wife and mother and lived for the comforts of her family and always extended a helping hand to others. She is survived by her husband Bulus, 7 children (who all returned home for the services), 18 grandchildren, 6 great-grandchildren; two sisters, Anna Reeves of San Fernando, Calif., and Betty Gilkey of Phoenix, Ariz., and one brother, Frank Gilkey of Echo, Ore. The Mullen Funeral Home was in charge of services. Memorials have been established for Pioneer Memorial Hospital or Cedarview Cemetery in Mullen.